Check your mailbox! 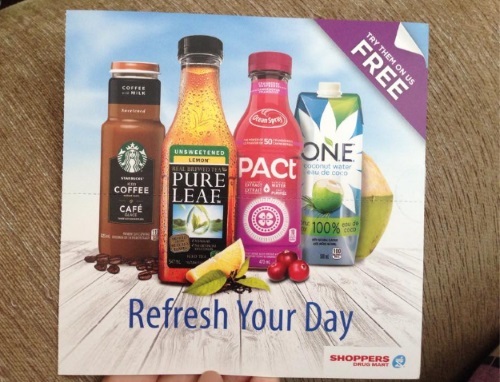 I got an awesome coupon booklet from Shoppers Drug Mart today. This has 4 Free Product Coupons for drinks. I love the Pure Leaf tea, I've been buying it a lot, so I was excited to see that coupon included. Please note, there was no signup for this, it just appeared in my mailbox. I shop at Shoppers Drug Mart often and buy a lot of beverages so perhaps I was targeted for this. I know there was a Joe Fresh lip product free coupon out earlier this year that I did not get. These coupons are valid until August 31, 2016. Did you get this coupon book? Let us know on our Facebook Page.